$98.76 Winco FW-S500 1200-Watt Electric Food Warmer 20" x 12"
A must-have for buffet-setups and catered events, the Crestware EFW Countertop Electric Food Warmer is perfect for keeping your specialty dishes at ideal serving temperatures for hours. 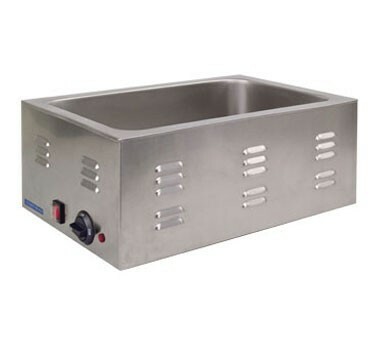 This food warmer features a full 18/8 stainless steel body which is rust proof and non-corrosive. This warmer's fully insulated bottom and sides ensure that the heat circulates within the equipment to keep your served food fresh. Thanks to its lighted on/off switch and heating indicator light, this food warmer is easy to operate.